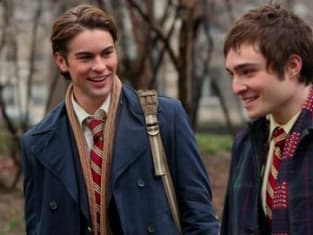 Due to Netflix's recent release of Gossip Girl Season 6, I find myself missing our favorite Upper East Siders. So what better way to reacquaint with them than a Gossip Girl rewatch? That's right, it's time to go back and review every single episode of this TV Fanatic favorite. However, there's no way to do this without acknowledging the fact that we know the identity of the famed blogger. But that's okay. That actually makes this fun. Were hints dropped along the way? How will our perception of the series be shaded by this knowledge? The first two things I notice are Serena's nose and Dan's sideburns. Both are really... different now. I can't believe how young all these characters are! Eric Van Der Woodson's sun-in hair is incredible. There are already so many things that will foreshadow future storylines. Jenny caught Dan on Gossip Girl's website. Lily makes a comment to Serena about doing "God knows what with God knows who" in boarding school. Gossip Girl season 4 school teacher drama anyone? I find myself epically confused to see Chuck Bass on public transportation with Nate and Dan. There's also a bunch of things mentioned in the pilot that obviously didn't stick when the show was picked up. For starters: The casting of Eleanor Waldorf! So glad they did, Margaret Colin in such a better choice. Chuck makes mention of his "parents" plural. Blair's non-existent country house is dropped a few times. The scenery is different. But then again, these are just minor pilot notes that change whenever a show is picked up and goes into production. Although there are a bunch of times when you can say "oh man I should've known it was Dan," Stephanie Savage said in her Gossip Girl finale interview that they didn't want it to influence Penn Badgley's performance. My favorite part was definitely when he's at the Palace trying to give Serena her phone and he's arguing with the doorman. I think Dan kind of liked his anonymity, but he liked Serena a lot more. As for everyone else: Serena was obviously fighting her true nature and trying to start over. Nate was a conflicted teenager, who sort of had a conscience, judging by his confession to Blair about sleeping with Serena. Blair was less amusingly neurotic and more forthright with her bitchiness. Lastly, is there anything worse than Chuck trying to force himself on two different girls? Welcome back to the Upper East Side. You know you love us. 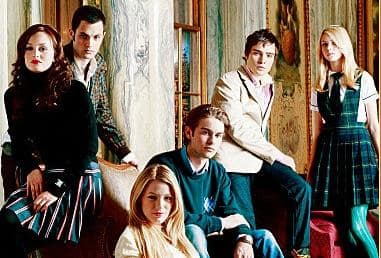 Join us all fall long for this Gossip Girl rewind and sound off on your favorite pilot points.